Earlier this month, we announced new intelligent event capabilities in Microsoft 365 that enable anyone to create live and on-demand events for teams and across the organization. Today, we invite you to use the public preview of live events in Microsoft 365 and discover new ways to foster connection and engagement between leaders and employees at every level in your organization. More than ever before, employees in the modern workplace seek work environments that unlock creativity, make their lives more productive and fulfilling, and foster a sense of connection with their organization’s mission and purpose. A critical first step for your organization to thrive in this new culture of work is to drive alignment of your people around shared purpose and goals. Leaders realize that organizations who do this well have an advantage in attracting and retaining an engaged workforce. Today, executives at Microsoft—including CEO Satya Nadella—use Microsoft 365 to connect and communicate with employees around the globe. Now, any company or organization with Microsoft 365 can create these moments of high engagement, where people are focused on leaders and their messages and ask questions to clarify or reinforce conversations in the community. 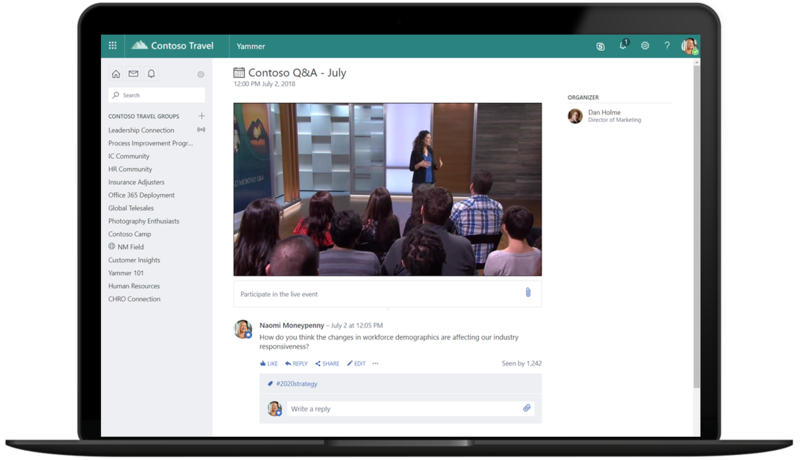 Using Microsoft Stream, Teams, or Yammer, you can create a live event wherever your audience, team, or community resides. Attendees receive notifications and can participate in real-time, with high-definition video and interactive discussion using web, mobile, or desktop. Following an event, it’s easy to make the recording available on an event page, allowing you to watch the event on your own schedule and catch up quickly with powerful AI features that unlock the content of the event recording. The recording is automatically transcribed and detects changes in speakers—making it simple to search for content later. For employees who are in different time zones or unable to attend live, the conversation keeps going, so they still feel connected to leaders and peers—helping to overcome geographical or organizational boundaries. The event and recordings are powered by Microsoft Stream, the intelligent video service in Office 365. Give everyone a voice—before, during, and after a live event in Microsoft 365—with Yammer communities that span functions or the entire organization. Providing a forum for employees to be heard is an important piece of transforming a culture. These communities are where people can come any time to raise ideas, concerns, or questions, and where leaders can reply in an authentic way. An active Yammer community builds trust and a sense of connection and belonging. And it provides a forum where employees who might not feel comfortable speaking out during a live event can connect directly with leaders. With inline message translation, live events in Microsoft 365 empowers people to express themselves in their own language. Communicate at scale as a leader with a continuous, online presence using content, conversation, and video channels within a SharePoint communications site. You can optimize for news distribution and blogs, and deepen engagement with related content, polls and surveys, and readership analytics. This is also a great spot to share recorded events for later viewing. Simply create a dedicated page for each event where employees can submit questions and comments in advance. Leaders and organizers can then use this input to craft the messaging and content of the events. Executive and internal communications may be managed by a team of one or a team of many—but it takes careful planning and execution to ensure success. Microsoft Teams—the hub for teamwork in Office 365—is ideally suited to work together in the creation and production of events and other executive communications. It provides an effective backstage for your live event, giving you a shared space to work with speakers and approve content before sharing with a broader audience. Once you have begun engaging your audience, every message within a Yammer community has a visible count of how many people your post has reached. This helps both community organizers and employees understand what is being read. Group insights demonstrate how the knowledge and information created in the community benefit people—regardless of their membership status in the group. For example, passive visitors may gain value from group conversations and apply the information elsewhere in their daily work. You can also see the number of views for an event recording and across a channel, and how many people liked the video. Pages and news articles also have statistics to understand readership. Leadership, of course, does not just refer to organizational leaders. Leaders of communities may be subject matter experts, functional managers, or passionate individuals who are leading areas of expertise, practices, or interest groups. These same capabilities in Microsoft 365 can enable leaders at any level to create and sustain the connection with their communities. Experience the public preview of live events in Microsoft 365, and get started on connecting your leaders and employees today. We will be adding additional features and functionality based on your feedback in the Tech Community. To create a live event, you will need an Office 365 E3 or E5 license and your admin must give you permission to do so. To attend a live event, you need an Office 365 license for authenticated users. Public (anonymous) access is possible in specific configurations.